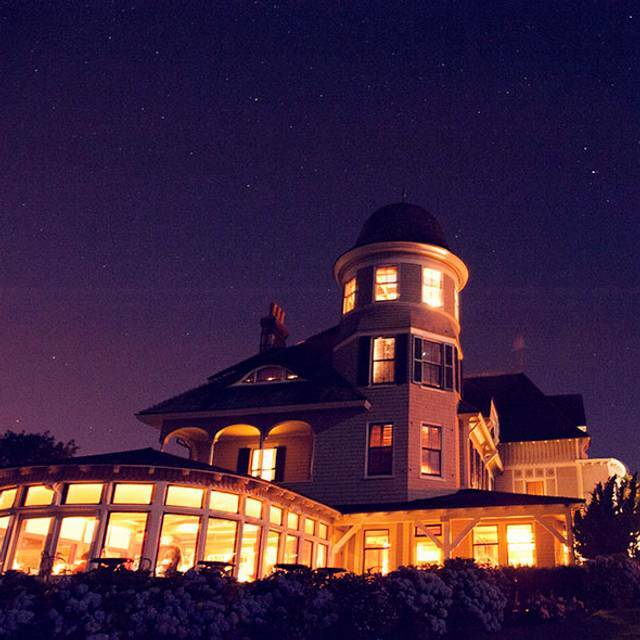 You must make reservations at least 5 minutes in advance of the time at The Dining Room at Castle Hill Inn. Private Dining services are available for our indoor spaces and our Chalet, featuring a range of capacities and menu styles based on applicable hours and seasonality. 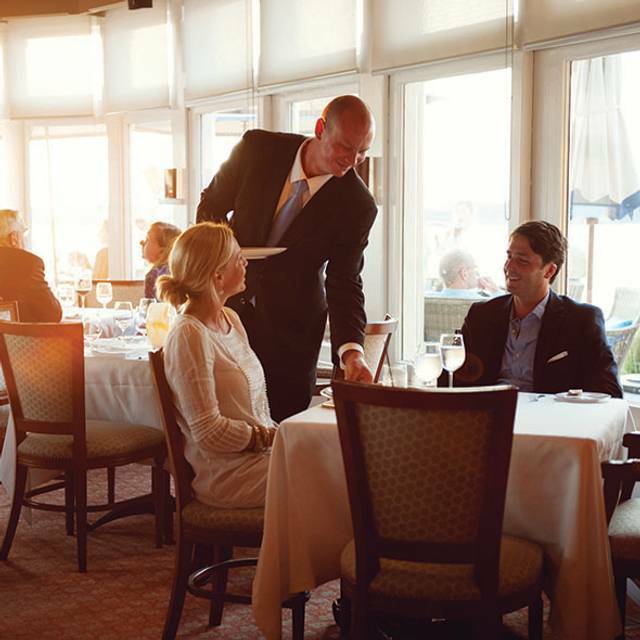 Please contact our sales department to coordinate private events at (401) 619-3830. 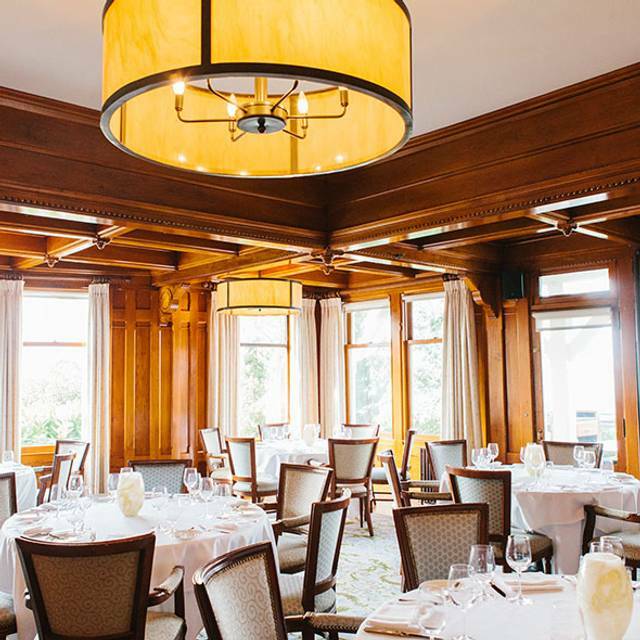 The Dining Room at Castle Hill Inn has been the backdrop of memorable occasions for over a century, residing inside a historic mansion built in 1875. 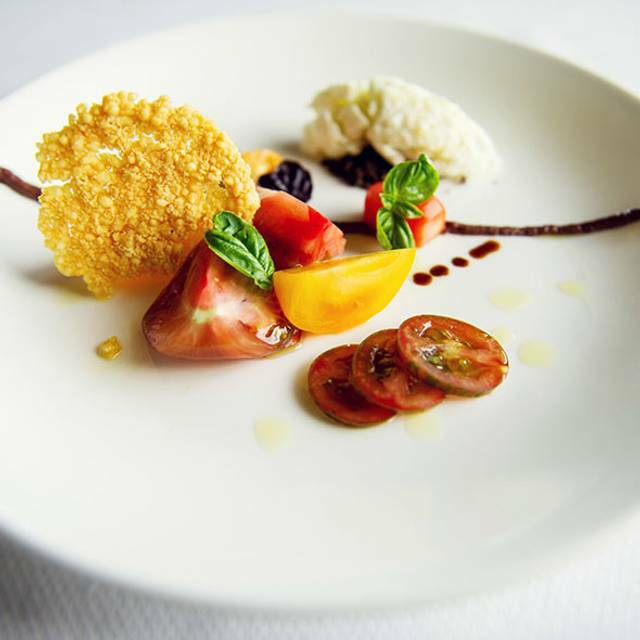 The Forbes Four Star restaurant presents a prix fixe menu showcasing the talents of Chef Lou Rossi and his culinary team. 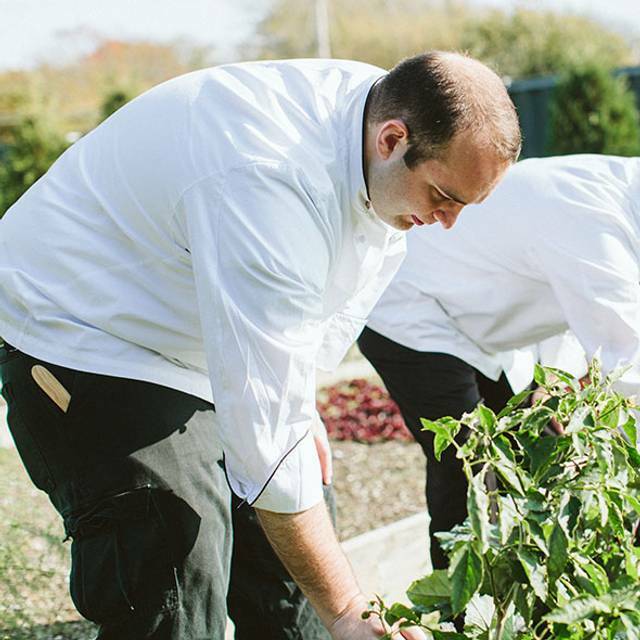 We are blessed with a location that is second to none in New England - not only for the view, but for the bounty provided by our surrounding lands being brough to your table. These range from local seafood surrounding Aquidneck Island, seasonal produce, and artisanal cheeses crafted throughout the region. We hope to serve you a meal that will speak both to the nostalgia and tradition of New England cooking, while inviting you to experience something new along the way. The wine list features over 800 selections, and has been awarded the “Best of Award of Excellence” from Wine Spectator for ten years running. We look forward to making great memories and traditions with you soon. Three courses: select your starter, main course and dessert. Five courses: Chosen by Chef to showcase the flavors of the season, with a few options for you to select along the way. We kindly ask that all guests at the table participate in the tasting menu. Available for each of our menu choices. Each time our menu changes, we taste a multitude of wines, spirits, and anything else we can gather to find the most complementary pairings for the dish at hand - these choices then become our beverage offerings for the season. We serve a small portion with each course to accent your meal. This is a special occasion place, but you will want to return as soon as financially possible. The lamb Wellington was out of this world and the wine pairing were perfect. Beautiful meal start to finish! The dinner was delightful and the chef was very willing to make accommodations to the menu for specific dietary requirements. The restaurant week menu had many fabulous choices. The food was delicious, atmosphere was great and the service was wonderful! Overall very happy with the restaurant week menu and choices we selected. Everything was wonderful from the greeting we received as we arrived to the service, food and ambience. Couldn’t recommend it more! Delightful, always have a wonderful meal! The best view you could ever wish for! Dan was excellent and made our Dinner Experience a night to remember. The food was wonderful and the drinks paired perfectly. Terrific restaurant with amazing everything!! The food and service are exceptional. We thoroughly enjoyed our meal in the round dining room with a beautiful view. The service was excellent, all staff members very friendly. Our waiter was very pleasant and knowledgeable, especially when pouring the wine tastings. All of our food courses (we chose the 6 course option), we not only artistically presented, but tasted delicious. It was a fun and relaxing night and I would highly recommend. The slow roasted sirloin was fairly tough. 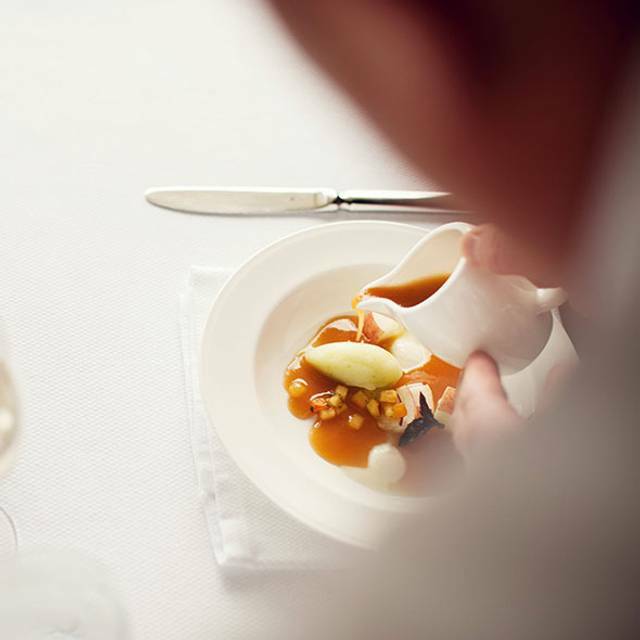 The service is impeccable at Castle Hill, and the menu is creative and delectable. Outstanding views, food and service. My family and I had such a great experience there. 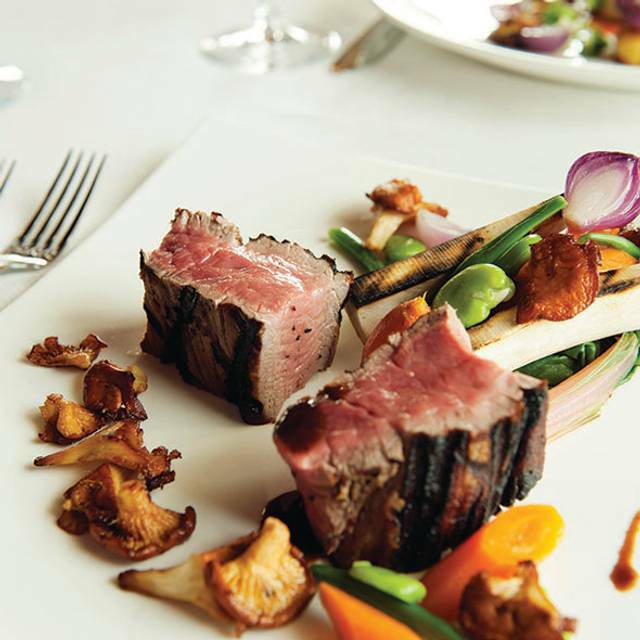 Restaurant week gives us the opportunity to visit great establishments such as Castle Hill. Such a wonderful dining experience. The staff were all both helpful and charming and we truly felt like it was more than just dinner it was an experience. A last minute dinner date. Service and food was some of the best ever! 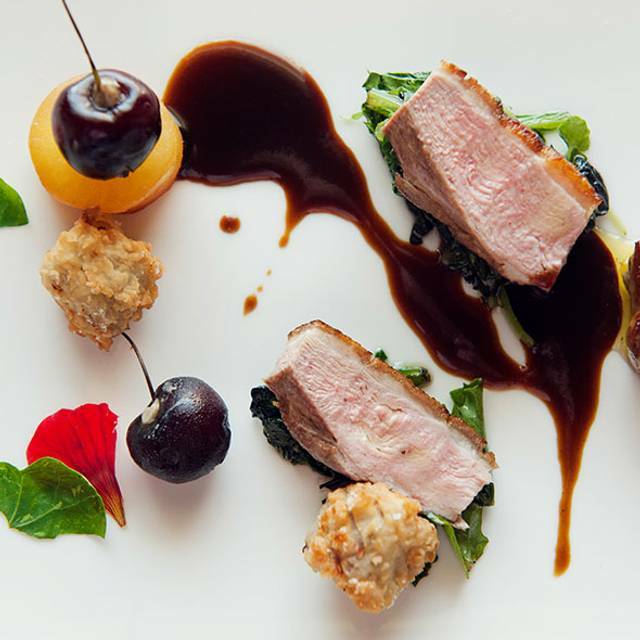 It's gotten easier to find great food experiences around the country in recent years, but harder to find a truly fine dining experience of the sort that is delivered at Castle Hill. The staff is highly attentive and extremely knowledgeable about the food and its preparation. The wine pairings were delightful -- not the obvious selection in all cases but all great pairing with great reasoning behind them. Any wine lover would do well to let the house make your selections. Overall, a dining experience that was elegant without ever seeming 'stuffy'. Tasty and imaginative (Chicken-fried cauliflower?? Who knew there was such thing and that it could be so delicious?) food, beautifully prepared and plated. The duck was at the perfect temperature and juicy; the fluke was crisp and moist. Portions were just the right size. The amuse-bouches were as creative and delicious as they were unexpected. The wine pairing was excellent, a perfect and balanced combination that handled a wide range of flavors (roast, salt, umami, sweet, acid) as they came up. The sunset was beautifully framed by the enormous windows; service was gracious, efficient and friendly, while discreet. A splendid two-hour dining experience, as special dinners should be. My only criticism of Open Table is that I was not able to receive ANY Open Table points for this visit and I don’t understand why. 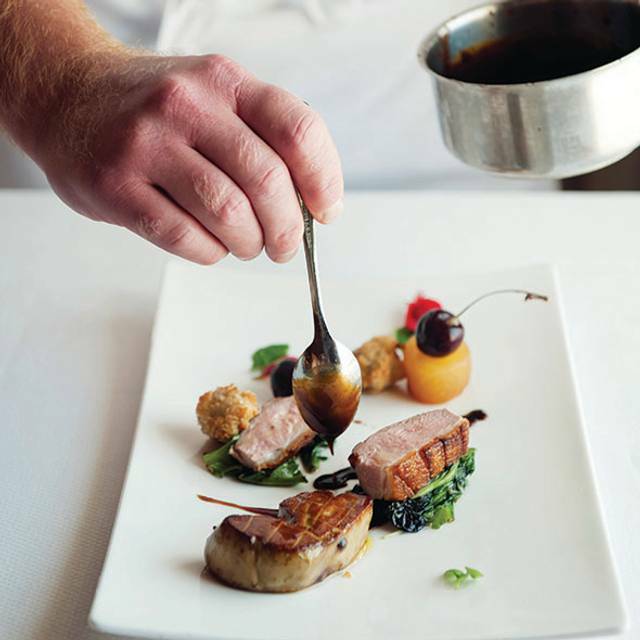 Castle Hill is more than fine dining, it’s an experience! Castle Hill is a complete experience. The service, the food, the setting in amazing. You will feel like royalty! Love it - all of it. Every time we come here it’s great! As always, impeccable service and amazing food. This is our go-to spot for special events. Finest restaurant in Newport. Wonderful evening we spent 2 hours and were not rushed. One of the premier dining spots in America, always a treat. The food is creative but not overwhelming the service is personable and pleasant. The wine list is impressive but there are great moderate priced alternatives. The view is one of the best on the East Coast. In all, a perfect night. A truly special experience. Execution was spectacular of both food menu and service. Guest focused experience was wonderful at a special location. Beautiful experience. Service is top notch and all of the food was excellent. I really appreciated how well the 4 course dinner was paced (I hate when food comes out too fast). We had a lovely, relaxing Valentine's weekend dinner. I was also thrilled that they had one of my favorite wines by the bottle and glass. For a wonderful, relaxing, top-notch experience I can't recommend Castle Hill Inn highly enough. Delicious food and the service was simply outstanding! Always a great time dining here. Restaurant offered a special 4 course menu and while the food was good it a little too much. It was very quiet in the area we were in even though they had a 3 piece string band. Service was very good and Castle Hill is an iconic location. Absolutely loved our time there. Nick was phenomenal and the food never disappoints. We had the fixed price three course menu which is what I would suggest as a means to control the cost but we were given a few extra tastes at no additional charge which was very nice. Also, the choices were combinations of tastes that I have never seen together. All in all, it was a very nice night out. Loved Castle Hill, everything was top notch. Even was surprised with gifts to take home for me and friend’s birthdays. Didn’t realize it was a fixed menu but everything was divine. Highly recommend. The Castle Inn is at a special scenic location in Newport and is especially fun in the warmer weather. We were there for a winter celebration. Our waiter was well informed but seemed to have an abundance of tables as noted when he said he would be back to discuss the menu and after a wait, we were greeted by another young woman. The food here is delicious and special. Our appetizers of Broccoli and cheddar soup and the Potatoes with truffles were delightful. However, we were disappointed with the lobster entree and the seared fluke. I am used to lobster that I often prepare by steaming that is sweet and juicy,, This roasted lobster with an additional $12.00 charge was not the aforementioned. Rather than that carrot puree, it needed a touch of sweet butter. The fluke which my husband had was not a favorite of his as it was also dry and had a strong fish flavor. We did finish with super desserts - the banana soufflé, which was elegant and delicious, as well as the simple, but yummy, ice cream with chocolate and caramel sauce. The complimentary truffles were lovely as was the amuse-bouche. I think the service that evening was impaired due to the gas outages in other Newport Restaurants that caused an influx of patrons at the Inn. We look forward to returning in the summer and sitting outside to enjoy the great food and the unparalleled view. Thank you to the exceptional team at Castle Hill for making our engagement dinner so memorable. From the moment we sat down, the team was so accommodating. Some friends had purchased us cocktails and wine to celebrate, and they took note of the occasion and repeatedly congratulated us. We each had the three course menu. I started sweet potato ravioli, and my fiance had the seasonal soup. It was divine! For dinner I had Seared Halibut. It was served with root vegetables in a chowder sauce- again amazing. My fiance had the pheasant and raved about it. For dessert we both had the Coffee Semifreddo and it was heavenly. It was the perfect portion for each course so you felt satisfied but not overly full. Our waitress was extremely attentive throughout. She made a wonderful wine suggestion that paired perfectly with everything we ate. We will definitely be back and hope to make this an annual tradition!